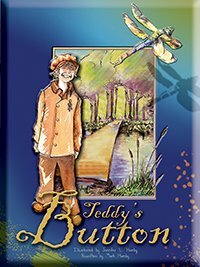 Teddy's Button Illustrated is part of the Children's Collection. Young and old alike will love this illustrated re-telling of Lamplighter's best seller! Beautiful illustrations now bring to life a story that is as precious as the one in our original Rare Collector volume. This illustrated version is sure to enlighten younger children and warm the hearts of anyone who reads it. This tale will open a child's understanding of the spiritual battle within as Teddy learns that he is his own worst enemy! As a stubborn boy and girl refuse to back down from their selfish pride, one of the many lessons they learn is that they cannot win battles by force and hate, but by carrying the banner of love. Through this charming story, Amy LeFeuvre helps children to understand the spiritual battle that rages in their souls, and that parents and children are on the same side. From Betsy L of Springfield, Ohio on 3/11/2019 . I've loved this book for years- used to read it to my fourth grade class every year. I have recently purchased it for two family friends for their boys, in the picture-version and am greatly impressed by it! A book that can change lives! From Anonymous of Elida, Ohio on 1/2/2018 . Beautifully illustrated book. Excellent read - family loved it! As Good as the Dramatized Story! From Trisha Dyal of Sunfield, Michigan on 11/20/2017 . We recently purchased this book as a Christmas gift, for one of our young relatives. He recently turned 6. I have the dramatized version of Teddy's Button, and this book with its compelling illustrations is just as good as the story. Now that I have seen both, I can hear the dramatized version in my head, as I read the book. Looking forward to giving this as a gift! From Anonymous of Greenville, South Carolina on 12/22/2016 . It is a beautifully illustrated book that we look forward to reading with our son. From Marlene of Mesa, Arizona on 8/14/2016 . This is a great illustrated version of an awesome Lamplighter book. The illustrations are beautiful and engage the reader. But know that although abbreviated there is a lot of text here. It grabbed my children and both went off and found a name for their enemy :-). Great message!! !